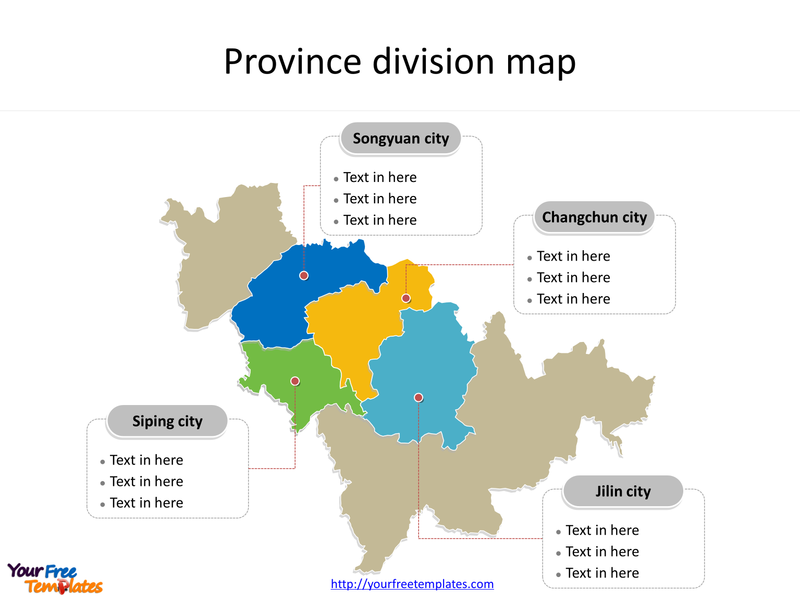 The Province of Jilin map Template in PowerPoint format includes two slides. Firstly the Jilin maps with outline is labeling with capital and major cities. Secondly the Jilin maps with outline is labeling with major divisions. So our Jilin maps PowerPoint templates have capital and major cities on it. They are Changchun, Jilin, Siping, Yanji, and Tonghua. Finally the most populated divisions are Changchun city, Jilin city, Siping city, Songyuan city. 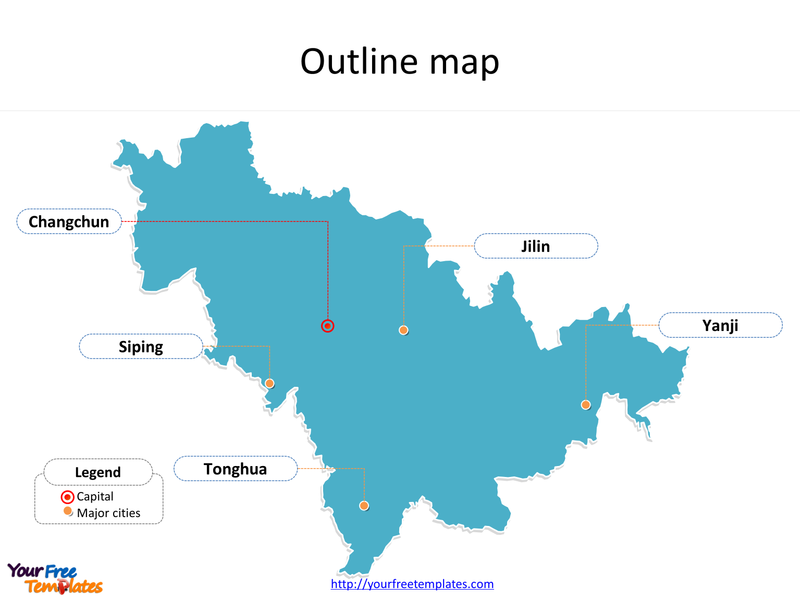 The Jilin maps PowerPoint templates include two slides. Firstly Jilin is one of the three provinces of Northeast China. Secondly Jilin borders North Korea (Rasŏn, North Hamgyong, Ryanggang and Chagang) and Russia (Primorsky Krai) to the east, Heilongjiang to the north, Liaoning to the south, and Inner Mongolia to the west. The most populated divisions in Jilin province are Changchun city, Jilin city, Siping city, Songyuan city. What is more, Jilin’s agricultural production is centered upon rice, wheat, maize, and sorghum. Rice is mostly cultivated in the eastern parts, such as Yanbian Prefecture. The Changbai Mountains are an important source of lumber. Sheep herding is an important activity in the western parts, such as Baicheng. Among its natural resources, Jilin has the largest reserves of shale oil and one of the top five largest mineral reserves in China. The labels and shapes are layers of different groups. In a word, you can change the texts, colors, sizes, and add your charts. At the same time you can also refer to the fully labeled Province of Jilin in Wikipedia. Believe it or not, analysts from marketing research companies, consultants from professional firms think highly of our website yourfreetemplates.com. Most important of all, our maps can help to reduce their efforts and create good-looking maps.